The Chocolate Works ~ Clitheroe. I am in big trouble! A Chocolate Cafe has opened in my home town…and you know, I cannot resist chocolate. 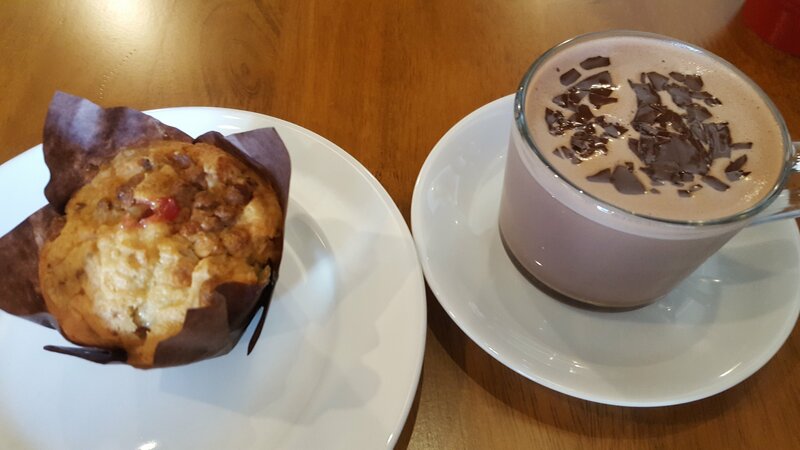 😁 The Chocolate Works on Castle Street serves up heavenly Hot Chocolate, Union Hand Roasted Coffee and has an amazing cake selection too. But of course if you are a Chocolate Cafe you have to pull out all the stops. To tantalise a chocoholics sweet tooth, the Chocolate Works menu includes freshly made Bubble Waffles, in a variety of fun flavours. Delicious Cakes and do I spy a Chocolate Fountain?? I won’t waffle on but these waffles are scrumdiddlyumptious! 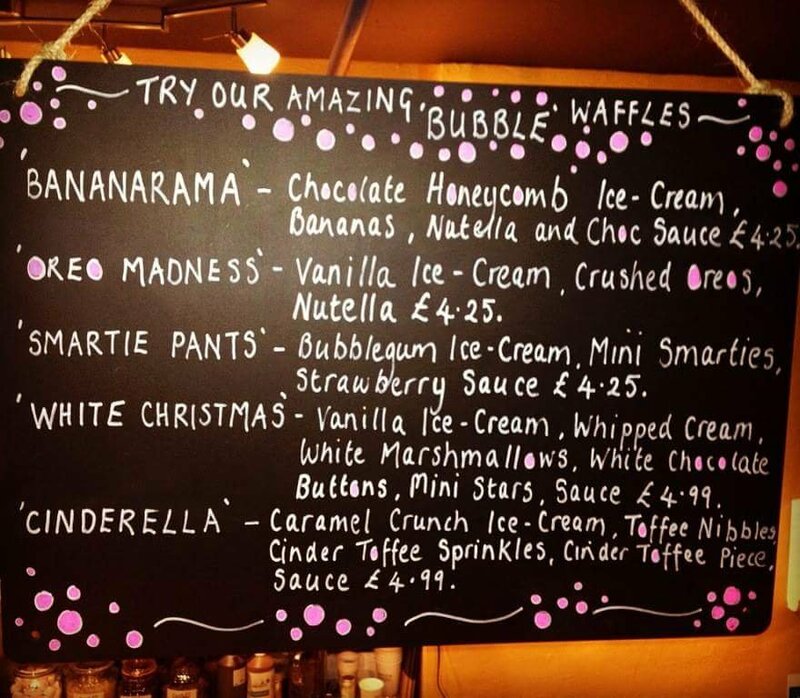 On a visit with friends at the weekend we seriously indulged and ordered off the Bubble Waffle Menu. I opted for the Oreo Madness , recommended by my 6 year old god daughter. 🙂 But what are Bubble Waffles, I hear you ask? The shop also sells a variety of chocolates, sweets and popcorn. Also on the menu are chocolate dippers ; marshmallows dipped in chocolate. I knew there was a use for that chocolate fountain! The staff are welcoming and friendly and the owner is very passionate about chocolate. He’s even started making his own on the premises. Chocoholics will not be disappointed! Previous PostHawthorn’s November Scavenger Hunt. Next PostA waterfall walk in the Dales. Good choices. 😁 Yep one good reason of many to visit Clitheroe! I sometimes think the full fat versions are better than low fat. There’s too much sugar in low fat items. Looks a delicious shop though! Wow!!!! I love “dark” chocolate, as I don’t find it as sweet & wonder if they offer that in different makes. OK, of course I don’t live anywhere near Clitheroe, but think we’ve been through on our travels. Good to have somewhere nice to meet for coffee & chat. Take care. Wow! That place looks dangerous! Chocolate paradise! A chocolaterie recently opened where I live but sadly, I was disappointed when I tried it. OK, someone book me a taxi to Clitheroe. The Cinderella one looks good! Think its a popular choice! Really enjoyed visiting this afternoon with my Mum but unfortunately the girl waiting on got Mum’s decaf Americano mixed up with my caffeinated! Mum’s now buzzing unfortunately not in a good way. Would still recommend the shop though. Oh dear thats a shame. I have not had the coffee but it does sound like an honest mistake.